Bullying can be very scary and painful for the person who is being bullied. Some strategies can help you take action against bullying. Stay with people you trust. You are less likely to be bullied if you have friends around you. Avoid places with higher risk. Places far from adult supervision give more opportunity for bullying. If you are being targeted in the back of the school bus, move forward. If you are having trouble in a faraway part of the cafeteria or playground, stay closer to trusted adults. Stand up for yourself. If someone is making you uncomfortable, tell the person to stop. Tell friends what is going on. They can help you stay safe. Tell a trusted adult. Get help if you need it. If you are trying to protect yourself, it isn't tattling to get an adult involved. If you see bullying, don't just stand by. If you do nothing, you encourage the person who is bullying. If you feel safe yourself, step up and speak up. Often people stop bullying when their target is no longer alone. If you do not feel safe, get help. Other students or adults can help you stand against bullying. If you are trying to protect another student, it isn't tattling to get an adult involved. Your Turn Think about protecting yourself. Write a paragraph telling what strategies you use to protect yourself against bullying, and what strategies you might try. Your Turn Think about protecting others. 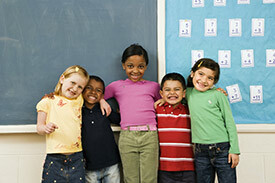 Write a paragraph telling what strategies you use to protect others from bullying, and what strategies you might try. Taking Action Against Bullying by Thoughtful Learning is licensed under a Creative Commons Attribution-NonCommercial-ShareAlike 4.0 International License. Based on a work at k12.thoughtfullearning.com/minilesson/taking-action-against-bullying.